Sierra Leone is officially a secular state, although Islam and Christianity are the two main and dominant religions in the country. The constitution of Sierra Leone provides for freedom of religion and the Sierra Leone Government generally protects it. The Sierra Leone Government is constitutionally forbidden from establishing a state religion, though Muslim and Christian prayers are usually held in the country at the beginning of major political occasions, including presidential inauguration. The vast majority of Sierra Leonean Muslims are adherent to the Sunni tradition of Islam. Most of the Mosque and Islamic schools across Sierra Leone are based on Sunni Islam. A significant portion of Sierra Leonean Muslims, at about 10 percent of the country's Muslim population are adherents to the Ahmadiyya sect of Islam. Sierra Leone has a vibrant Ahmaddiya Muslim population, and there are five hundred Ahmaddiyya Mosque across Sierra Leone. Shia Muslims form a very small percentage, at less than half of one percent of Sierra Leone's Muslim population. Most of Sierra Leonean Muslims of the Sunni and Ahmadiyya sect regularly pray together in the same Mosque. The Maliki school is by far the most dominant Islamic school of jurisprudence across Sierra Leone and is based within Sunni Islam, though many Ahmadiyya Muslims in Sierra Leone also follow the Maliki Jurisprudence. The Sierra Leone Islamic Supreme Council, is the highest Islamic religious organization in Sierra Leone and is made up of the country's Imams, Islamic scholars, and other Islamic clerics across the country. Sheikh Muhammad Taha Jalloh is the president of the Sierra Leone Supreme Islamic Council . The United Council of Imams, is an influential Islamic religious body in Sierra Leone, that is made up of all imams of mosques throughout Sierra Leone. The president of the United Council of Imam is Sheikh Alhaji Muhammad Habib Sheriff.. The two largest mosques in Sierra Leone are the Freetown Central Mosque and the Ghadafi Central Mosque (built by former Libyan leader Muammar Gaddafi), both located in the capital Freetown. The large majority of Sierra Leonean Christians are Protestant, of which the largest groups are the Wesleyan _ Methodists and Pentecostal. Other Christian Protestant denominations with significant presence in the country include Presbyterians, Baptists, Seventh-day Adventists Anglicans, Lutherans, and Pentecostals. The Council of Churches is the Protestant Christian religious organisation that is made up of all Protestant churches across Sierra Leone. Recently there has been an increase of Pentecostal churches, especially in Freetown. In September 2017, a Sierra Leone-based radical Nigerian Pentecostal Christian pastor name Victor Ajisafe was arrested by the Sierra Leone Police and held in jail after he preached an extreme religious intolerance and a fanatical hate speech against Islam and Sierra Leonean Muslims at his church sermon in the capital Freetown. Among other words in his speech; Ajisafe said Islam is an evil religion, and he further said there is no trace of Islam in the history of Sierra Leone; even though factually Muslim missionaries have peacefully thought Islam in Sierra Leone over 430 years ago and the country has remained a Muslim majority for centuries. Ajisafey waa apparently angry and jealous after a Zimbabwean internationally renowned Muslim cleric Mufti Menk visited Sierra Leone and had approximately over one hundred thousand people in and outside the national stadium in Freetown to listen to his Islamic sermon in his visit to Sierra Leone on 21 to 23 September 2017  Many Christian organizations in Sierra Leone, including the Council of Churches condemned Ajisafe's sermon against Islam and Muslims. Ajisafe"s church was temporarily shut down by the Sierra Leone government and his church license was temporarily suspended too. The incident brought religious tension in Sierra Leone, in a country known for its very high level of religious tolerance, as many Sierra Leonean Muslims at home and abroad were extremely angry. Many Sierra Leonean Muslims called for Ajisafe to be deported back to his home country of Nigeria, and few even threatened to attack the church. The pastor while in Sierra Leone police custody apologized to Sierra Leonean Muslims and to the government of Sierra Leone. After several days in jail, Ajisafe was released, his church license was given back to him, and his church was later reopened under strict government condition during several months of probation. The vast majority of Temne are Muslims at over 85%; and with a small Christian minority at about 10%. The Mende are also Muslim majority at about 70℅, though with a large Christian minority at about 28%. 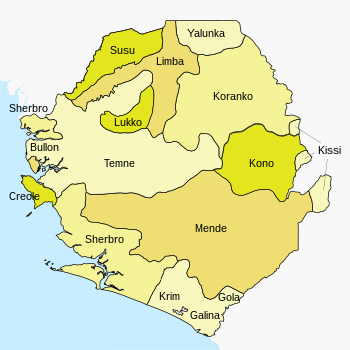 Sierra Leone's national politics centres on the competition between the north-west, dominated by the Temne, and the south-east dominated by the Mende. The vast majority of the Mende support the Sierra Leone People's Party (SLPP); while the majority of the Temne support the All People's Congress (APC). The third-largest ethnic group are the Limba at about 6.4% of the population. The Limba are native people of Sierra Leone. They have no tradition of origin, and it is believed that they have lived in Sierra Leone since before the European encounter. The Limba are primarily found in Northern Sierra Leone, particularly in Bombali, Kambia and Koinadugu District. The Limba are about equally divided between Muslims and Christians. The Limba are close political allies of the neighbouring Temne. The Krio have traditionally dominated Sierra Leone's judiciacy and Freetown's elected city council. One of the first ethnic groups to become educated according to Western traditions, they have traditionally been appointed to positions in the civil service, beginning during the colonial years. They continue to be influential in the civil service. The vast majority of Krios are Christians at about 95%, though with a small but significant Muslim minority at 5%. The vast majority of Sierra Leonean Christians are Protestants with biggest groups being Methodists and various Evangelical Protestants. Other Protestant denominations in the country include Presbyterians, Baptists, Seventh-day Adventists and Lutherans. Roman Catholics are the second largest non-Protestant Christians division in Sierra Leone at about 5% of the country's population. The Jehovah’s Witnesses, Anglicans and Latter-day Saints form a small minority of the Christian population in Sierra Leone. The constitution of Sierra Leone provides for freedom of religion and the government generally protects this right and does not tolerate its abuse. ^ "Sierra Leone 2016 International Religious Freedom Report" (PDF). US Department of State. 2017. Retrieved 2 October 2018. "Religion in Sierra Leone: All things happily to all men". The Economist. 31 May 2014. Retrieved 12 July 2014. This page was last edited on 28 November 2018, at 10:55 (UTC).